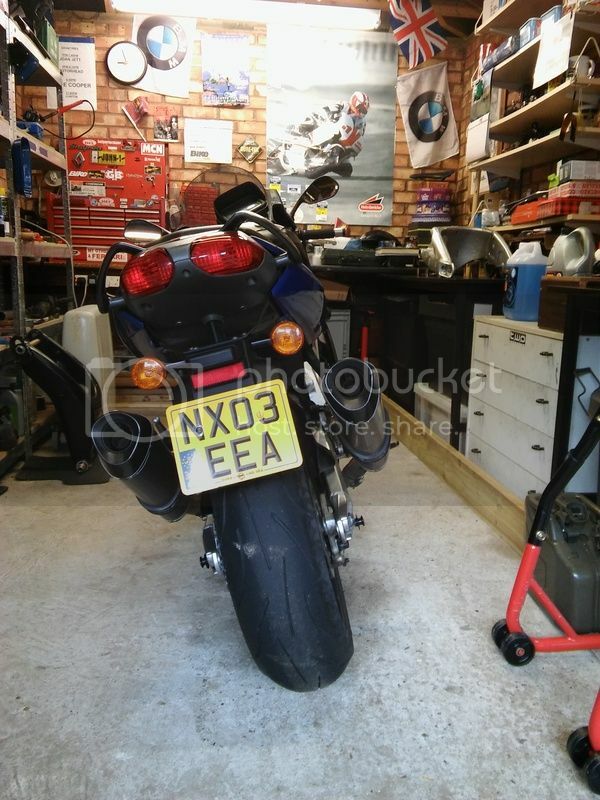 Yes the first of Gen 2, I have the whole bike and was thinking of taking the whole front end and putting it on the Falco? I cant use the factory on the road here due to the laws in relation to written off bikes!! it's either that or make it a track bike ..... you can modify the engine to run on falco electrics ....go on you know you want to woohoo!!!!!!! Hi I note that it has been some time since you have put the RSV swing arm in the SL1000 (falco). How does this handle? Do you know if the Ohlins front end and rear shock from a 2004 Factory would fit straight into an SL?? when you say 2004 factory do you mean gen2 ?????? The front end fits ....as long as you have the matching ohlins yokes as your old forks are 53mm and ohlins 51mm top diameter....you can't mix and match gen1 and gen2 yokes as they have a different offset....2.5mm disc spacers required to put the discs central in the calipers. 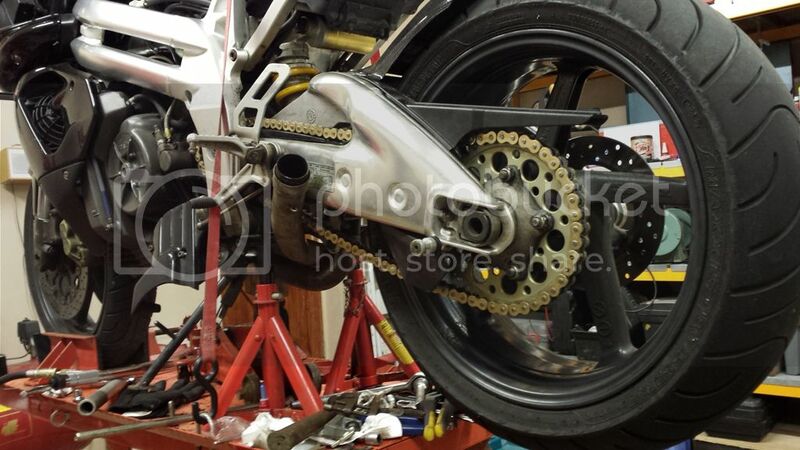 Were there any problems with the exhaust and the RSV swingarm? Im doing mine soon ,Ive got a black and a Silver not sure which one to fit . You can see them in this pic. Couldn't you leave the pipe in place? 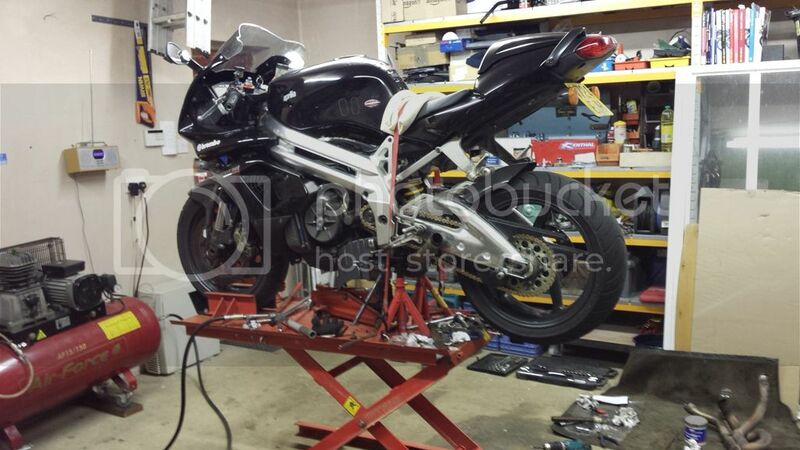 At the weekend I got around to fitting the Mille swingarm I had with the bike. All in all the job was pretty easy except removing the rear exhaust bolts which were a fiddly PITA. I also fitted the Mille triangle links by accident (because I didn't know no better) which raised the rear miles too high. Treated myself to a new chain and sprokets too.